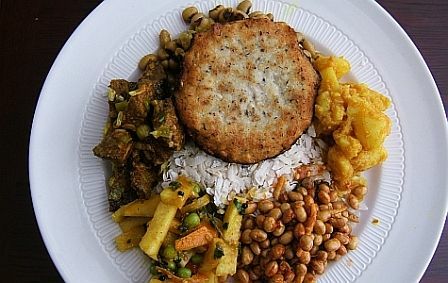 Kathmandu cravings: Top Nepal foods you can't miss - Integration Through Media ....! By Jenni Marsh, KATHMANDU, (CNN): The Kathmandu Valley is a dusty jungle of motorbikes, temples and tourists. 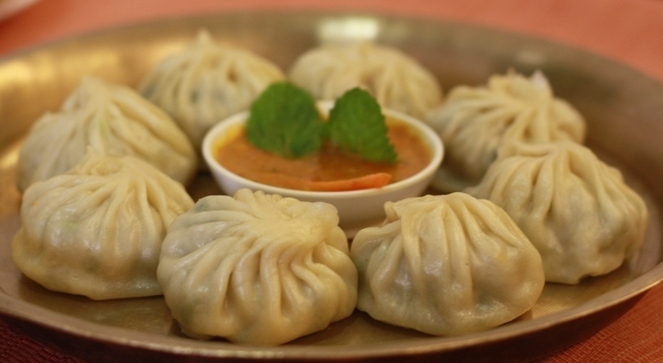 Believed to have originated in Tibet, a momo is a small steamed bun usually served with a tomato-based achhar (chutney). Aside from the normal vegetable and meat filings, today there are more adventurous options such as cheese and even mashed potato. Choose whether to get your momos steamed, fried or (we think, the best way) kothey — half fried, half steamed. Where to get it: Cafe du Temple, Patan. Cost: Rs 300 ($2.77). These cute fish-shaped treats are steamed rice-flour dumplings containing sweet fillings such as chaku and, more recently, chocolate. They’re normally served with a sweet dip. A popular festive dish, yomari are often eaten around the post-harvest celebration of Yomari Punhi. But you can enjoy them anytime. Where to get it: Village Cafe, Pulchowk, Patan, 44601. Rs 200. The staple food of Nepal, this thick lentil soup is made from black lentils or beans, which are slow boiled to give a thick, gloopy texture, and then seasoned with the Himalayan herb jimbu. 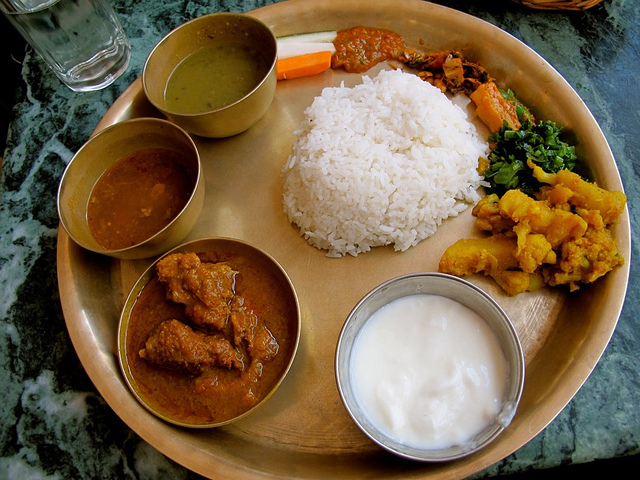 Dal bhat is normally served as part of a thali set — a metal tray holding separate metals bowls containing rice, curry, pickles and vegetables. The dishes are all poured onto the tray and eaten together. Where to get it: Cafe Swotha, Patan, 44600. Rs 800. The direct translation of “juju dhau” is “King of Curd” — a slogan you’ll see plastered all over Bhaktapur, where this yoghurt is the local dish. 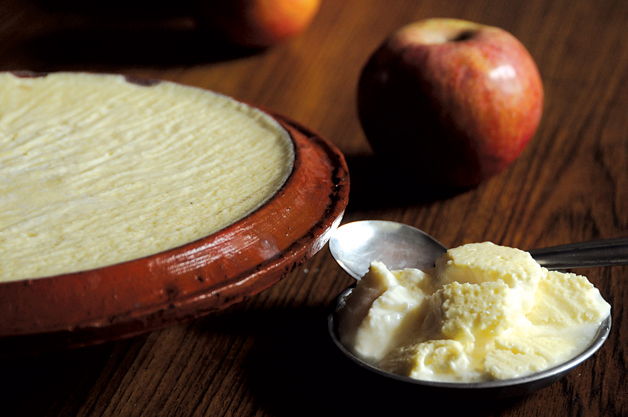 Made from buffalo milk, this light yoghurt is characterized by the delicious custard-like lumps it’s laced with. It’s made by boiling buffalo milk that’s been sweetened with honey and then poured into a clay pot. That pot is left in a warm area, wrapped in cotton blankets, until the yoghurt sets. Where to get it: Anywhere in Bhaktapur. Rs 200. 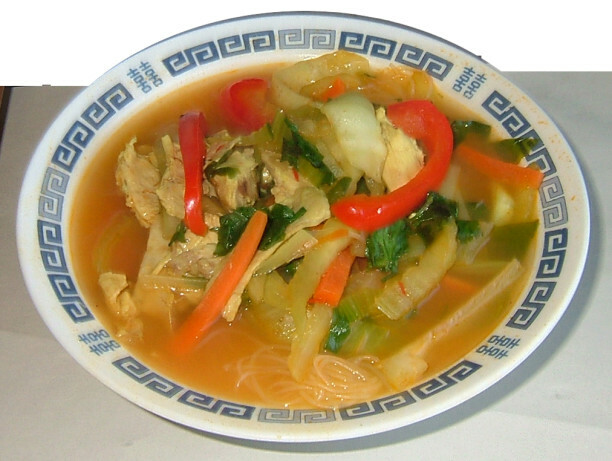 Thukpa is a noodle soup that originated in the eastern part of Tibet. It consists of boiled, hand-pulled noodles, vegetables and meat — normally shredded buffalo (the large Hindu population in Nepal does not eat beef). The punchy Nepalese variation features garam masala and chili. Where to get it: Tibetan Kitchen, Boudhanath Stupa. Rs 300. Nothing in Nepal says home cooking like mass ko bara. These light patties are made from dark lentils, which have been soaked overnight, then ground into a paste and mixed with masala. This mixture is then shaped into small circular discs, before being fried in mustard oil. At the last minute, an egg is cracked over it and minced meat is added. More of a street food, bara aren’t served in Kathmandu restaurants. Venture down the side-streets, and locate a small bhatti — a sort of Nepalese speakeasy — where usually one chef will be sitting beside a huge iron tawa, sizzling these tasty snacks. Where to get it: Honacha, behind Krishna Mandir at Patan Darbar Square. Rs 100. 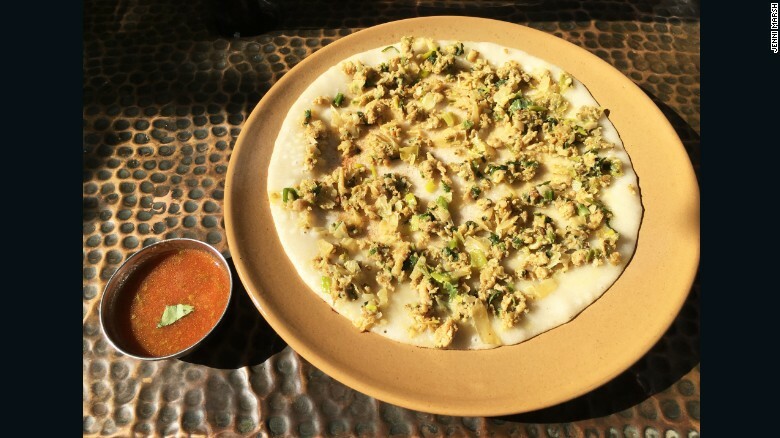 This thin, rice-flour crepe decorated with delicious toppings is the Nepalese version of pizza. 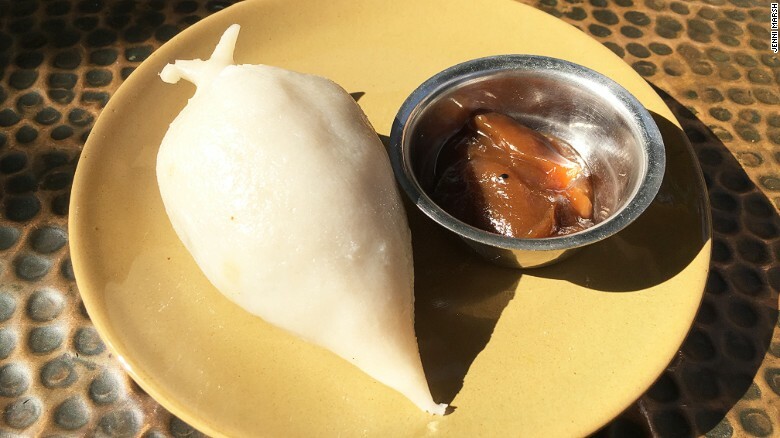 A specialty of the Newar people of the Kathmandu Valley, what used to be a snack is now served at restaurants across Kathmandu. It’s normally topped with an egg, meat and onions. Where to get it: Village Cafe, Pulchowk, Patan 44601. Rs 200. 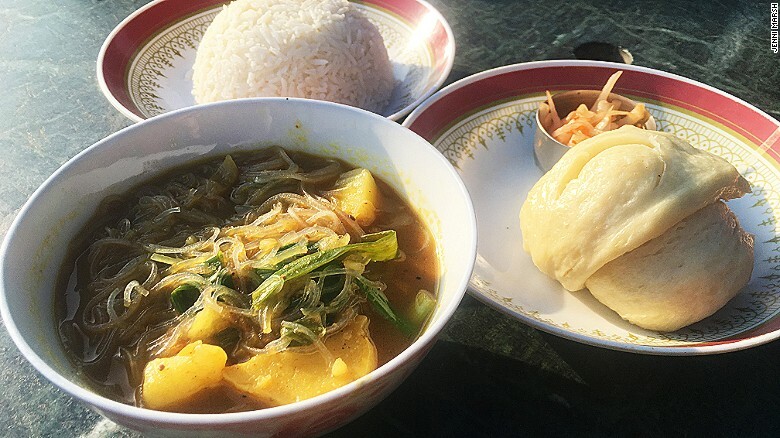 The influx of Tibetan refugees to Nepal since the exile of the Dalai Lama in 1959 has also brought an influx of Tibetan foods, like this dish. Tingmo is a steamed, porous bread, designed for dipping into soups and broths. Aloo phing consists of translucent noodles, potatoes and vegetables in a hot broth. Sliced radish and rice are served on the side.